Gotta Play Tennis: REFLECTIONS...Wile E. Coyote or Road Runner on the court? REFLECTIONS...Wile E. Coyote or Road Runner on the court? Wile E. Coyote and Road Runner are a duo of cartoon characters from a series of Looney Tunes and Merrie Melodies cartoons created in 1948 for Warner Bros. Wile E. stands for the world "wily"–an adverb which means "gaining an advantage, especially in a deceitful way. In the cartoon, the coyote is always attempting to capture this incredibly fast bird who always outsmarts or outruns the predator's elaborate plans and schemes. Why the trip down memory lane? Today my style of play was referred to as "wily." In other words, I was not gaining the upper hand in rallies from overpowering play but from something else. It was my shot selection, variety of spin, sneaking to the net, drop shots, and everything else that made my opponent have difficulty finding a solid rhythm. This is not to be confused with pushing the ball since my hitting partner would assure you that ripping winners on groundstrokes from midcourt is not pushing. But this is not the way I would win most of the rallies. I was, as he put it, wily. While growing up and watching these cartoon characters of Wile E. Coyote and Road Runner, it was always clear that one was nefarious while the other had enough skill and smarts to get away. I never identified with the coyote until now. And you know what? 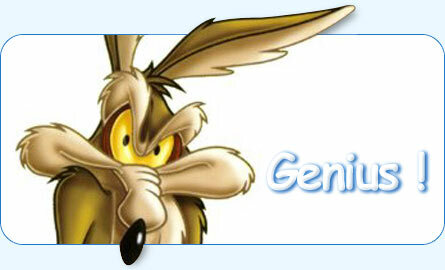 I'm now proud to be a Wile E. fanboy. You see, tennis is hard on the knees, feet, ankles and toes. I will only be able to "meep, meep" like the road runner for a finite amount of years. But I can always become a better and smarter coyote. AND SO CAN YOU!